Now let’s turn to the US women biathletes. The women haven’t managed to produce any results comparable to Tim Burke’s recent success, but there are a ton of young skiers it seems trying to change that. I’ve noticed a lot of collegiate cross country skiers switching over (or maybe back) to biathlon after graduated, and this is particularly the case with the US women, where I’m beginning to wonder if the USBA hasn’t entered into some secret arrangement with Dartmouth College to develop athletes for them. These are just the WC, OWG and WBC results for these four skiers. 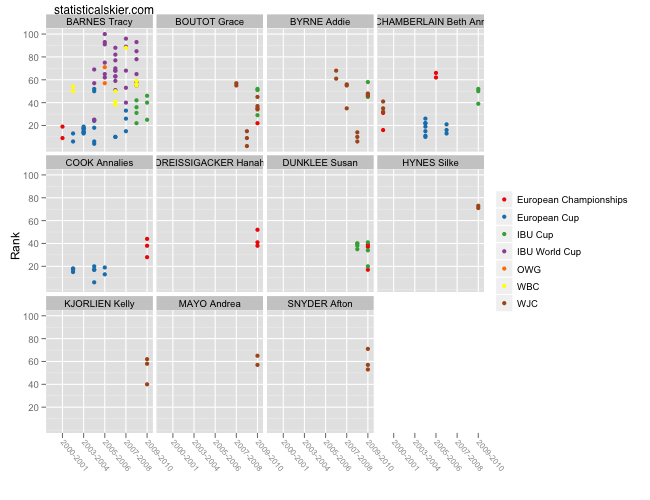 Sara Studebaker might have had the most promising season last year, despite not actually having the best results, which came from Lanny Barnes (23rd/~6.5% back at the Olympic 15k) and Haley Johnson (21st/~8.6% back in a 15k World Cup). In both cases Barnes and Johnson shot well (Barnes shot clean, Johnson missed one standing target). How about all the other up-and-comers (along with Tracy Barnes, who’s been around a while but didn’t race any WC/OWG races last year that I can see)? 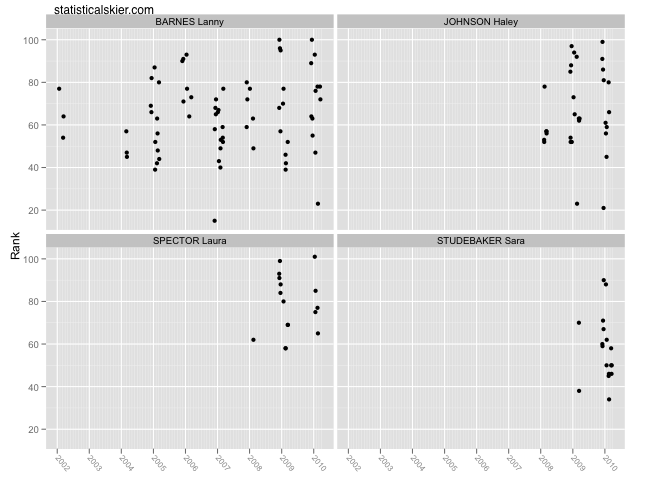 My apologies to Ms. Chamberlain and Ms. Dreissigacker; I don’t feel like going back and redoing this graph to accomodate for your unusually long names. Feel free to ridicule my laziness. I’ve plotted the finishing place of a bunch of different types of races together here. That means that the only sensible comparisons are really within each color. And I don’t know enough about these races to comment on who’s results might be the most promising. Lanny Barnes has been fairly consistent with her accuracy and Haley Johnson has been steadily improving. 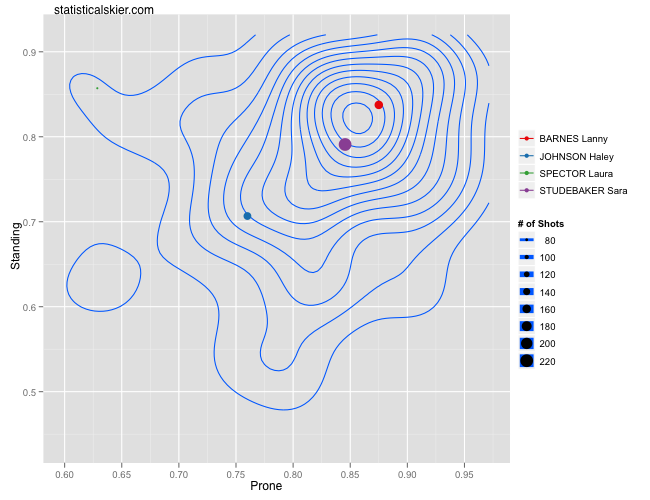 For a newcomer, Sara Studebaker shot quite well, as some subsequent graphs with illustrate. Laura Spector had a big gap between her prone and standing accuracy, but that’s from a rather small sample size. The contours represent all female WC biathletes with at least 50 shots. 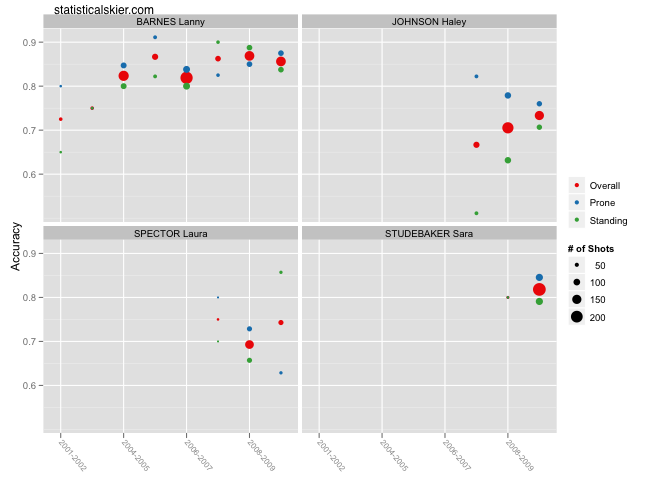 Then I’ve plotted the accuracies for the four US women, with the size of the dot being proportional to their respective sample sizes. Laura Spector’s green dot is hard to make out due to her small sample size, but it’s there in the upper left. Recall that it’s better to be towards the upper right corner. Last season, Lanny Barnes’ shooting appears to have been slightly better than average, Sara Studebaker’s slightly below average. As I said, for a newcomer on the WC scene, I’d hazard a guess that that’s pretty good shooting. While we noted above that Haley Johnson’s shooting has improved steadily over the last few seasons, it still was pretty far behind where it needs to be for her to be competitive. Posted by Joran on Wednesday, December 1, 2010, at 6:00 am. Filed under Uncategorized. Tagged biathlon, haley johnson, lanny barnes, laura spector, sara studebaker, season preview, usst. Follow any responses to this post with its comments RSS feed. You can post a comment or trackback from your blog.